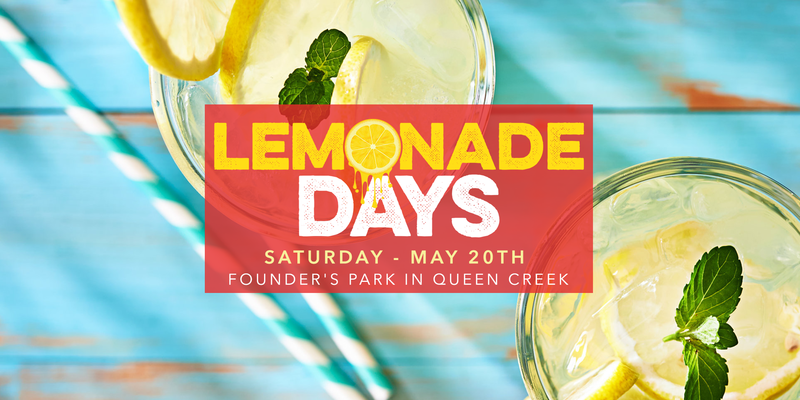 Celebrating the sunny days of summer in Queen Creek, Lemonade Days is set to return this Saturday, from 12-8 p.m. at Founders Park. Lemonade Days is a community event packed with fun for the whole family, featuring local restaurants, seasonal cocktails, craft beer and summertime novelty snacks. Highlights include a kid’s zone with water slides and bounce houses, Arizona’s largest lemon squeeze, hot dog and hamburger eating competitions, live entertainment, Kornhole games, and an Arnold Palmer putting booth/driving range. Food vendors include AZ Barbeque Catering, Doughlicious, Waffle Crush, El Jefe Tacos, Jerky Boys Beef Jerky and Sweet Thangs Bakery. Headlining the entertainment will be Georgia Chrome, a local country band known for their high-energy performance and a wide range of rock, country and pop cover songs. Also on the entertainment lineup – local superstars, Laura Walsh, Honey Girl, Tommy Price & the Stilettos and the Hour Glass Cats. General admission for Lemonade Days is $8 online during the presale and $10 at the gate, kids 12 years and under will be admitted for free. Bring any non-perishable food item and receive $2 off walk-up pricing on general admission. VIP admission is $45 per person and it includes access to a private seating area, private restrooms, six alcoholic beverages, unlimited soft drinks and water, catered food and exclusive stage view access. For more information and to purchase tickets online, visit the event website at www.lemonadedaysaz.com. Lemonade Days is the perfect way to kick off another summer of special memories with friends and family. A portion of the proceeds from Lemonade Days will support the Foster Hope Foundation which operates with a mission to inspire a brighter tomorrow for Arizona’s foster children. Through fundraising efforts and donations, the Foster Hope Foundation can provide much-needed supplies, clothing, personal items, activities, lectures, workshops and scholarships to children within the foster care system. For more information and to learn about how you can get involved visit www.fosterhopefoundation.org.